Pavlovas are definitely something new to me. While they look and sound fancy, it’s basically like a cake made out of a giant toasted marshmallow with whipped cream and whatever else you want to put on top. Or you could think of it as a giant meringue with toppings. Any way you look at it, it’s delicious. It has a sweet, crispy outside with a soft, marshmallowy inside. Ah-mazing. To tell you the truth, I don’t even like marshmallows but I still think pavlovas are delicious. It may be because it’s only raw marshmallows that I don’t like, but I do like toasted marshmallows or those dehydrated marshmallows that come in sugary cereals. Basically, if it’s got a crunch to it, it’s ok. The gummy, foamy texture of raw marshmallows is just gross to me. Blegh. I’m sure I’m in the minority with my marshmallow preference, but the point is, I think most people, even if you don’t normally like marshmallows, will like pavlovas. Definitely give this recipe a try. Until recently, I had never even heard of a pavlova nor had I ever seen one. Strangely, it was backyard chickens, a white elephant gift and finally Mary Berry that opened my eyes to the sweet, delicious world of pavlovas. First, we got backyard chickens. This was a few years ago but it’s really what started me on the pavlova path. Since we had so many eggs all the time, we were going a little egg crazy and thinking of everything we could make that was egg based. Of course, frozen custard was on the list since it contains egg yolks but alas, we had no ice cream maker. We considered getting the attachment for the KitchenAid, but those are all pretty pricey. I researched some recipes that didn’t require an ice cream maker but I just wasn’t that excited about potentially wasting eggs for sub-par frozen custard. So that was put on the back burner for a while. Then, this past Christmas, my husband’s grandmother had her annual white elephant gift exchange. Normally, white elephant means you don’t buy anything. You find something in your house you no longer want (the funnier the better), wrap it up and throw it in the gift pile. Then the grab-bag rules of gift selection begin. It just so happened that this year THERE WAS AN ICE CREAM MAKER IN THE PILE! Whaaaaaaattt???!!! It was fate. You better believe Chad and I stole that thing (stealing is actually part of white elephant for those that don’t know) and clung to it tooth and nail until the bitter end. Or in this case, the sweet, sweet, frozen custard filled end. THEN, of course we went home and made a bunch of frozen custard! And what happens when you make frozen custard? You use a bunch of egg yolks and have a bunch of egg whites left over. I think a had a container of twenty some leftover egg whites going. It was getting ridiculous. So I started looking up recipes that used egg whites. Angel food cake came up a lot. Swiss meringue or Italian meringue icing both use egg whites. My Lemon Cream Crumb Cake uses egg whites. But around this same time, I was binging on The Great British Bake Off, or as it’s called on American television, The Great British Baking Show. It is THE best baking competition show there is. Hands down, stop searching, this is the baking show you need to watch. The hosts of the show, Mary Berry and Paul Hollywood, are always challenging the contestants to make a variety of different baked goods. 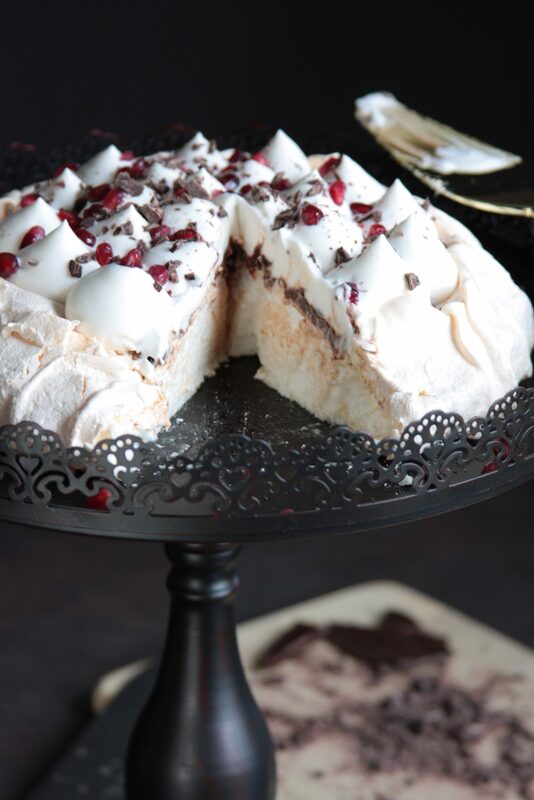 One of those baked goods, that I think has come up a few times over the various seasons, is the pavlova. Each baker puts their own spin on it (unless it’s the technical challenge, of course) and they always look so impressive. More importantly, they always use egg whites in the recipes. Ding ding ding! And that is the long version of how pavlovas entered my life. Pavlovas are actually ridiculously easy. There are definitely those few super finicky parts to the recipe that need to be done just so, but I’ve made probably 3-4 versions of this now and it has turned out well every time, so I think I’ve nailed down a fail-proof method. One of the finicky things about this recipe is unless you really want to live on the edge and risk your pavlova collapsing, you really need to weigh the ingredients, not measure them by volume. If I say use 4 large eggs, even if our versions of “large” were the same, there’s no guarantee the same amount of egg white is going to be in each of those eggs. The proportion of egg whites to sugar is a huge part of what makes a pavlova work. So bust out your kitchen scale, or buy one here and get free shipping with Amazon Prime. Another finicky thing is you can’t open your oven AT ALL the entire time it’s in the oven, and it’s in the oven overnight. If the pavlova cools too quickly, it will crack or fall. A few cracks are acceptable and sort of part of the organic looking pavlova charm but things can get ugly pretty quickly if you try to rush the cooling process. Start it the night before and don’t plan on using your oven until the next day. The last finicky thing you really have no control over and that’s the weather. 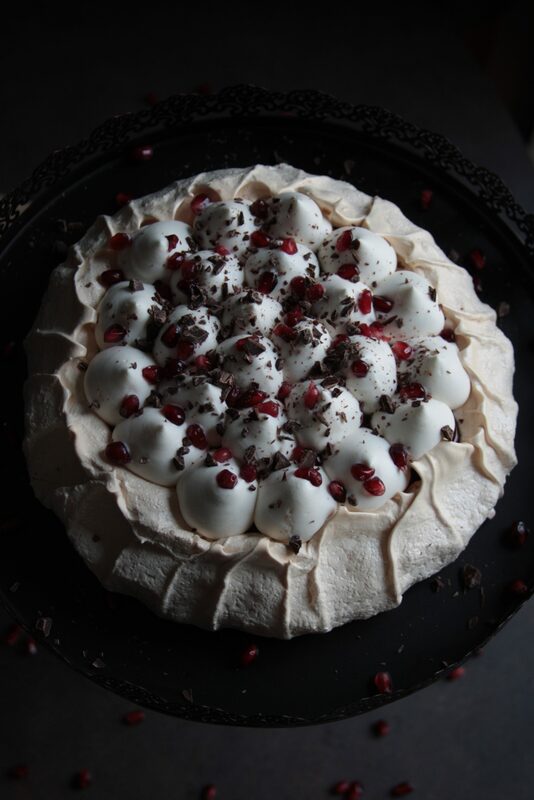 Pavlovas are basically created by slowly drying out a heap of meringue to create the crisp crust on the outside with a soft marshmallow left in the middle. 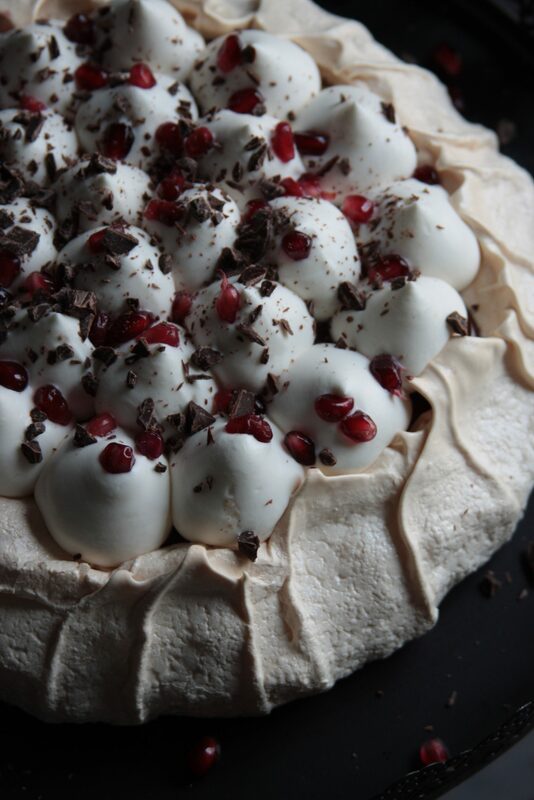 If it is very humid outside, this becomes difficult and the pavlova is more likely to collapse. One of the reasons I think I’ve had such great success with making them is I’ve made them all in the winter. Dry weather is perfect for making pavlova even though the standard fruit toppings make it seem like more of a summery treat. I do intend to try it out a few times this summer to test it for myself but even the whipped topping does not hold up well in hot humid weather. Even though light, airy marshmallow and fruit may make you think summer, this one will likely stay in my winter recipe arsenal. A fancy looking but deceptively simple dessert. Use the suggestions here or top it with whatever fruit/candy/sweets you like. 225 grams granulated sugar superfine sugar would probably be better but I've always used granulated. Separate 200 grams worth of egg whites while the eggs are still cold. Bring the egg whites to room temp before whisking them. They will stiffen up best this way. There cannot be any trace of yolk in the whites or they will not rise properly. The bowl and whisk you use must also be perfectly clean or the whites will not rise properly. Use an 8 inch round cake pan, or anything else that's about 8 inches in diameter, and draw an 8 inch circle on a sheet of parchment paper. Flip the paper over so the pencil doesn't transfer to the pavlova but you can still see the outline as a guide. Set the paper on a baking sheet. In the very clean bowl of a stand mixer fitted with a very clean whisk attachment, whisk the egg whites until they get foamy and start to stiffen. With the mixer on a medium speed, add the sugar one spoonful at a time until completely incorporated. Turn the mixer on high and beat until the whites are stiff and glossy. They should be able to hold their shape very well and if you rub a bit of the mixture between your fingers, it should not feel grainy at all. All of the sugar should have dissolved. Add the vanilla and sprinkle the cornstarch over the top. Mix until well combined. Pour the mixture out onto your prepared piece of parchment paper, staying well inside the circle. Now comes the shaping part. You want the pavlova to not be wider than the eight inches you've drawn and you want it to be concave in the middle, or dip down a bit like a shallow bowl. I like to use an icing spatula and get the rough shape and then go around the outside and pull up from the bottom creating a more finished appearance. You could also leave it looking more rustic (that's a pretty traditional look) or use a star tip on a piping bag and pipe the pavlova. Get creative! Just keep it withing the eight inch round that dips slightly in the middle. 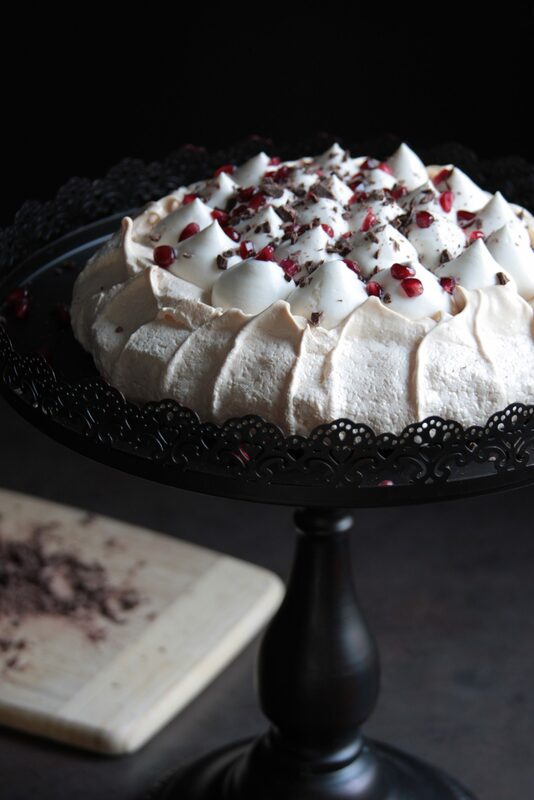 Gently put your pavlova in the oven and immediately reduce heat to about 240 degrees. Don't slam your oven door shut and don't go stomping around your kitchen or the pavlova could collapse. Cook for 2 hours then turn off your oven WITHOUT OPENING THE DOOR. EVER. NOT EVEN TO PEEK. Opening the door will cause it to crack more during the cooling process and could cause it to collapse. Leave it in the oven with the door closed at least for 4 hours but preferably overnight. I also keep a baking stone in the bottom of my oven at all times which keeps the temp of the oven more even and it stays hotter longer which further slows down the cooling process. The next day, take a deep breath, cross your fingers and pray that it hasn't collapsed as you open the oven door. Keep in mind a few cracks along the outside are normal and if you've shaped it in the same way as my pictures, the outer shell will have pulled away from the center leaving a crack along the inside but this is not visible from the outside and will be covered with your topping. Carefully transfer your pavlova to a serving plate. Put the chopped chocolate in a small bowl. Heat the cream in the microwave or on the stove until it just barely starts to simmer. You don't want to scorch the cream. Wait ten minutes, then use a spoon to stir the mixture until smooth and glossy. Be sure to get all the chocolate from the bottom and sides of the bowl incorporated. Let the mixture cool slightly, then pour over the center of the pavlova. Beat the heavy cream until smooth and airy. WATCH IT CLOSELY. The cream should be stiff enough to cling to the whisk without dripping when you raise the arm of the stand mixer but it should be smooth and not chunky. Spread the whipped cream over the top of the ganache, or you could pipe it for a cleaner look. I used a Wilton 2A tip. 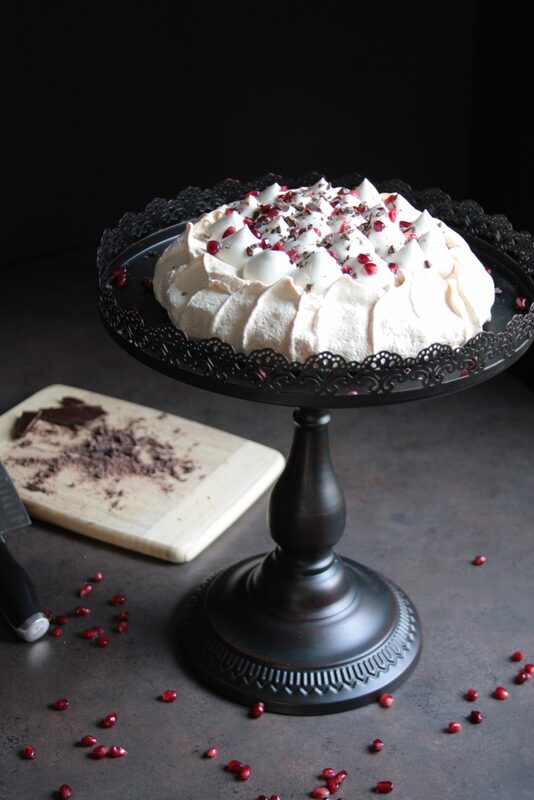 Sprinkle the pomegranate arils and chopped chocolate over the top of the whipped cream. Does anyone else out there hate the texture of raw marshmallows, or is it just me? What other fruit and sweets flavor combos do you think would work well with this? I’m thinking I’d like to try strawberries and graham cracker chunks or caramel and toasted coconut. 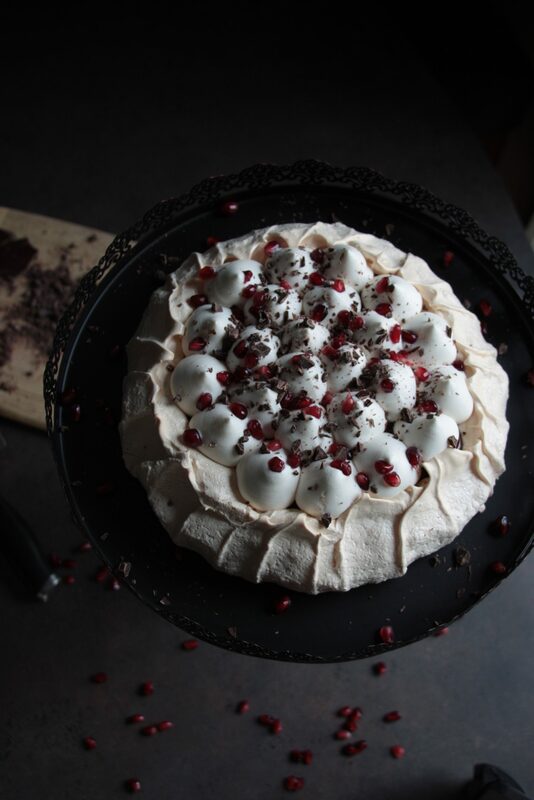 Do you have any pavlova horror stories? Comment below!